Need help planning a garage? Garage plans come in so many sizes, designs, and materials that it can be overwhelming. Do you want a stick-built wood frame building, or a steel arch building? What size do you really need? Do you want to figure out how to build a garage yourself from scratch, or buy a kit, or have a modular building delivered to your site ready to go? What type of door is the best for your situation? Which type of heater will work the best for you? The goal of this website is to help you make the right decisions by providing information on all the options you have when looking at different garage building plans. Building a garage is quite an investment. The garage plans you choose will affect the outcome more than anything else. Choosing the right design is by far the most important decision you will make in the entire process. There are some key points to consider when selecting a design. The first decision you need to make before even looking at garage blueprints is what size will suit your needs the best. Should you be looking at three car garage plans, or would a two car design actually be enough? Many of us would love to have room for six cars, but most people don't have a need for a shop that big, or even enough property to build one that size. Spend some time thinking about what you will be doing in your new space. If you work on big four wheel drive trucks, you might be looking at completely different garage plans than the person who is into British sports cars. Do you need workbenches (or tools and equipment) lining the walls, or do you just need extra indoor parking space? If your new structure will do double duty as a woodworking shop as well as a place to work on cars, consider plans with a separate workshop area. Garage building plans come in many different styles. It is best to choose a design that matches or complements the style of your home. This is especially important when adding a new shop that is attached to your home. A detached design can be more flexible, but you still don't want it to stand out like a sore thumb! If you live in a subdivision, you may be restricted to certain sizes, styles, or construction materials. One thing you DON'T want to do is to detract from the resale value of your home. If you live in a nice home in a good neighborhood or subdivision, as tempting as it may be to throw up an inexpensive steel arch building beside your house, you probably don't want to! Spending a little more up front to make the new building match your home is a wise choice that will add to the value of your home, instead of making it hard to sell. Your neighbors will likely thank you for it, too! If you live out in the country or have a little more property where you can separate the building from your home, or your neighborhood has a variety of different types of buildings, you have a little more leeway in your building style. In these cases, a steel arch building or a metal-sided pole barn can be a very attractive option. They are less expensive and quicker to construct than a stick-built garage, and won't stand out as much as they would in a typical subdivision. One factor that most of us have to consider is construction costs. As we said earlier, building a garage is a large investment, and most of us need to balance size and style against our budget. Most experts will tell you to build the biggest one you can afford. However, if you have a limited amount of funds, you have to weigh the benefits of more space vs. what else you could do with the money you save by building smaller. Garage plans are almost always a compromise, at least for us "regular" folks! One way to save money, of course, is to do as much of the work as possible yourself. If you have some basic carpentry skills, a few tools, and the time to do it, building a garage is not all that difficult. You just tackle one step at a time. Garage building kits can be a good compromise between figuring out how to build a garage by your self and hiring a contractor to build it. Kits are available in a number of sizes in both wood and steel, and they can save you a considerable amount of time. Having a few buddies to help out sure doesn't hurt, either! When deciding on a particular set of garage plans, the bottom line is to make sure you choose the design that will suit your specific needs the best. There are thousands of ready-made plans available for stick-built wooden structures. There are many more options with pole barn kits, steel arch buildings, and modular buildings. Consider what your needs are, decide what you are going to be doing in your new space, and then look for the garage blueprints that will work the best for you. There are lots of places online to find garage plans. The biggest selection I have found is available at The COOL house plans company. Behm Design also has a great selection. 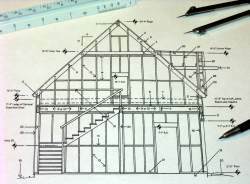 I have a review of an inexpensive collection of 58 different blueprints on my detached garage plans page. That package is a great value, and there are some really neat designs in there. Several of the designs are "expandable" - they are designed to house one or two cars to start with, but you have the ability to easily add one or two extra bays in the future. As you are planning your new building, there are a number of different decisions you will need to make. You will need to select doors, decide where you want the electrical outlets and lights to be, and decide which storage or organization system to use. You may also want (or need) to consider a heating system. This website aims to help you in all of these areas, by giving you unbiased information so you can make educated decisions. We will be adding pages weekly (sometimes daily!) as time goes by, so stop back by often as you plan your new building to see what's new. Just remember: Build as big as you can afford (or have room for), because no matter how large it is, you will always wish it was just a little bit bigger! I promise to use it only to send you my newsletter. GaragePlansEtc. - Helping you plan your garage one step at a time! There are tons of websites that sell garage blueprints. Here is a directory of the sites with the largest selection of garage designs and garage plans. Picking the right garage building plans - How to make sure you choose the best garage floorplans for your individual needs, for now and in the future. Garage building kits come in several different styles. Here is a quick summary of the types of prefab garage kits, with links to more info on each design. Each type of garage door has its own pros and cons. Learn about each type, and how to choose the best garage doors for your particular situation. There are a number of different garage heating systems available, and each one has pros and cons. Check out our heater guide for info on each type. Wiring a garage is a bit different than wiring a new bedroom addition, especially if the garage will be a workshop too. Check out these garage wiring tips. Two Car Garage Plans - Are 24 x 24 garage plans big enough? Don't make a mistake and build too small! Check out our links to free 2 car garage plans. 3 car garage plans come in many shapes and sizes. Check out these tips on planning for your future needs before deciding on three car garage plans. 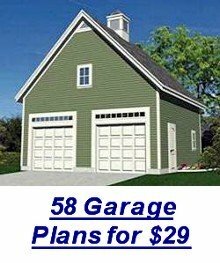 A comprehensive guide to the best free garage plans on the web. Ten different sources where you can get useable garage blueprints at no cost. If you want to build a pole barn, there are tons of free pole barn plans online. Here is a guide to free pole building plans that could be used for a garage. Pole barn kits are one of the quickest, easiest, and most affordable ways to build a garage or workshop. Here is a look at the basic design options. Wood garage kits - A quicker and easier way to build a garage. Here we take a look at the 6 basic types of wooden garage kits, with a quick summary of each. Modular garages are quick and easy to set up. 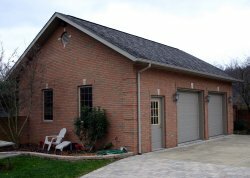 Pre built garages come in many different styles - Here is a look at the types and sizes that are available. About Garage Plans Etc., specific advice on how to plan and build a garage that suits your needs the best. Contact Garage Plans Etc. using this form. . We welcome any suggestions, constructive feedback, or questions. Please let us know if you discover any mistakes. The Garage Plans Blog keeps you up to date with all new additions and updates to the Garage Plans Etc. website. Subscribe here. Terms and Conditions for GaragePlansEtc. Disclosure Policy for GaragePlansEtc.com. We believe in being as transparent as possible. This site contains advertising, and we may earn a commission if you click on an ad or purchase a product.